Coastal martens were believed extinct in California, until they were rediscovered on the Six Rivers National Forest in 1996. The bushy-tailed carnivores were once common, but now fewer than 100 of them survive in California, while an unknown but very small number are still found in Oregon. The marten faces a barrage of threats, including logging, fire, climate change, trapping in Oregon, vehicle strikes, rodenticide poisoning and small population size. Represented by Earthjustice, the Center for Biological Diversity and the Environmental Protection Information Center are suing the U.S. Fish and Wildlife Service for failing to protect the coastal marten under the Endangered Species Act. The two conservation groups first petitioned for protection for the coastal marten, sometimes known as the Humboldt marten, in 2010. The groups are now challenging the Service’s April 2015 decision not to award federal protection to the marten. The bushy-tailed carnivores were once common, but now fewer than 100 of them survive in California, while an unknown but very small number are still found in Oregon. A slender mustelid related to minks and otters, the coastal marten survives only in three isolated populations in old-growth forest and dense coastal shrub in Northern California and southern and central coastal Oregon. The marten faces a barrage of threats, including logging, fire, climate change, trapping in Oregon, vehicle strikes, rodenticide poisoning and small population size. In denying the marten protection, the Service ignored the best available science, including its own scientific report. In the past year, the agency has come under increasing criticism for overruling its own scientists and too often bowing to political pressure. 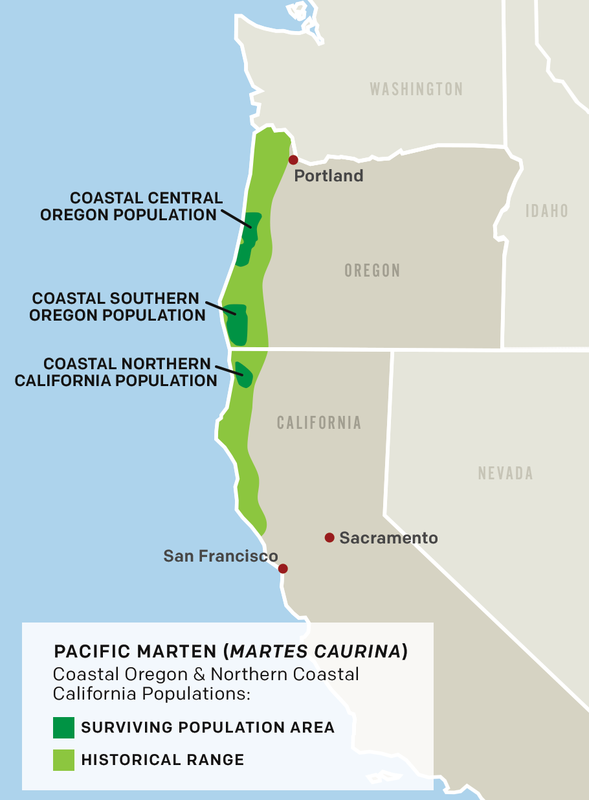 The coastal martens’ historic range extended from Sonoma County in coastal California north through the coastal mountains of Oregon; in Oregon the marten now lives only in a small area within Siskiyou and Siuslaw national forests. Coastal martens were believed extinct in California—with 95 percent of their old-growth forest habitat lost and a history of excessive trapping—until they were rediscovered on the Six Rivers National Forest in 1996. In 2009, the first California marten to be photographed in recent times was detected in Prairie Creek Redwoods State Park by remote-sensing camera. The extremely secretive animals are known for their slinky walking motion and expert hunting skills. Typically about 2 feet long, with large, triangular ears and a long tail, they eat smaller mammals, berries and birds, and are preyed on by larger mammals and raptors. A federal judge overturns an April 2014 decision by the U.S. Fish and Wildlife Service denying endangered species protection to coastal martens. The court’s action is in response to a lawsuit filed by Earthjustice on behalf of the Center for Biological Diversity and Environmental Protection Information Center. Before the Court are Plaintiffs‘ Motion for Summary Judgment, ECF No. 54, Federal Defendants‘ Cross Motion for Summary Judgment, ECF No. 57, and Defendant Intervenors‘ Cross Motion for Summary Judgment, ECF No. 59. For the reasons set forth below, the Court denies Defendants‘ and Intervenors‘ motions, and denies in part and grants in part Plaintiffs‘ motion.